Bartle’s Quotient include four quadrants of categories, which include socializer, killer, explorers, and achiever after completing a set of test questions to classify players of multiple online games (MMORPGs). The socializer is diplomatic and is seeking an identity in the gamification realm. In addition, the socializer will help, share and comment during games by building creating interpersonal relationships with other gamers. The killer is a tactical gamer and seeking to proceed in the world of gamification by dominating over other players. And the killer will cheat and hack his/her way to win, and find any way possible to move up in XPs. The explorer is a gamer that is rational and seeks undiscovered information and finds unknown features of the game. Also, the explorers will discover, investigate and create various things in order to move on in each level. The achiever is a logistical gamer and seeks security in order to win in the realm of gamification. Lastly, the achievers main goal is to be the best in the game by achieving levels. All individuals have the ability to fit in a certain quadrant, including students in my classroom. Based on the readings by Lee and Hammer (2011), the use of gamification in schools can allow students to create and develop a solid framework for understanding. Students have the opportunity for further deepening their own learning through exploration and completing quests. In addition, some students work hard to advanced to the next level, which will maintain focused and motivated to continue their learning’s. Also, this form of motivation can change the self-esteem of learners and allow them to participate more in schools If gamification was implemented for students, it will motivate students to learn better and to care more about their education. Lastly, by integrating projects that are like gamification will allow student to practice real world problems and become better learners and problem solvers in real life. The first challenge in gamification strategies based on competition and win, public humiliation though leader boards and accumulation of points. I would try to remind students that its not the time of completion but the process and the end goal that is important in the realm of gamification. The second challenge would be the lack of human contact and keeping gamification as a solitary game. I would change the solitary and competitiveness in gamification and create quests were students must work in teams to achieve a goal. The last challenge might be finding allowing students time at home or at school to complete the quests to enhance their own learning. I would have to build an excitement and encourage parents to allow their child to play a game online. The parents at my school might not like the idea, if I don’t introduce the topic clearly with excitement, I might not have parental support at home. I have a “mini” gamification system in my class, in which students earn badges when they use Edmodo and behave in class with Class Dojo. The Class Dojo chart is published and students can see the progression bar. In Edmodo, when students comments during discussions, they receive badges. I would like to plan a gamification experience by implementing both badges and progression bar into one activity. For instance, I would like to plan a “CA Missions Quests” in which teams work together and go through the “El Camino Real” quests. They learn about each CA mission with informational texts and resources. Once, students explored and learned about each mission, students can have final project, which shows their XPs of completing the projects. The final project will be replicating “El Camino Real” with facts about each mission in California. Lee, J. J. & Hammer, J. (2011). Gamification in education: What, how, why bother? Academic Exchange Quarterly, 15(2). Roa, V. (2013). Challenges of implementing gamification for behavior change: lessons learned from the design of blues buddies. 1-4. 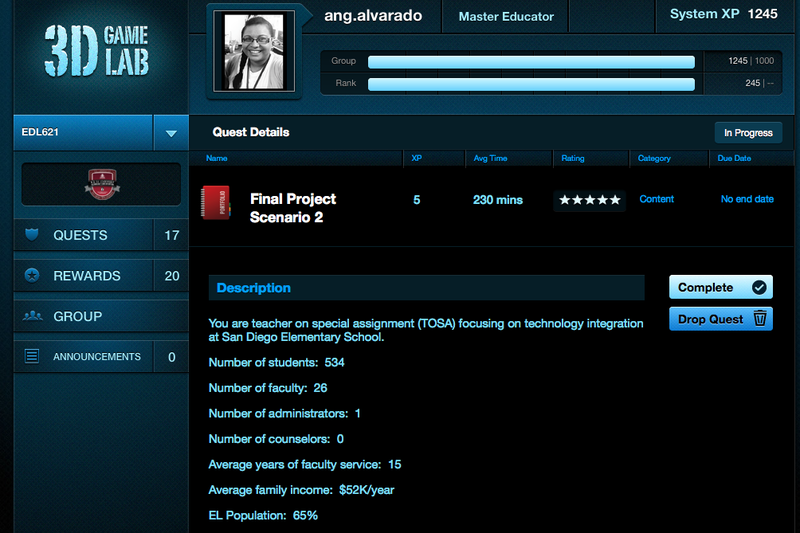 The gamification process was very powerful and insightful in my own learning. I didn't realize that I had it in me to transform into a gamer. I was motivated to earn more XPs and the Progression Bar guided my journey through the various quests for EDL 621. Overall, great concept to integrate in classrooms for the 21st century learners. 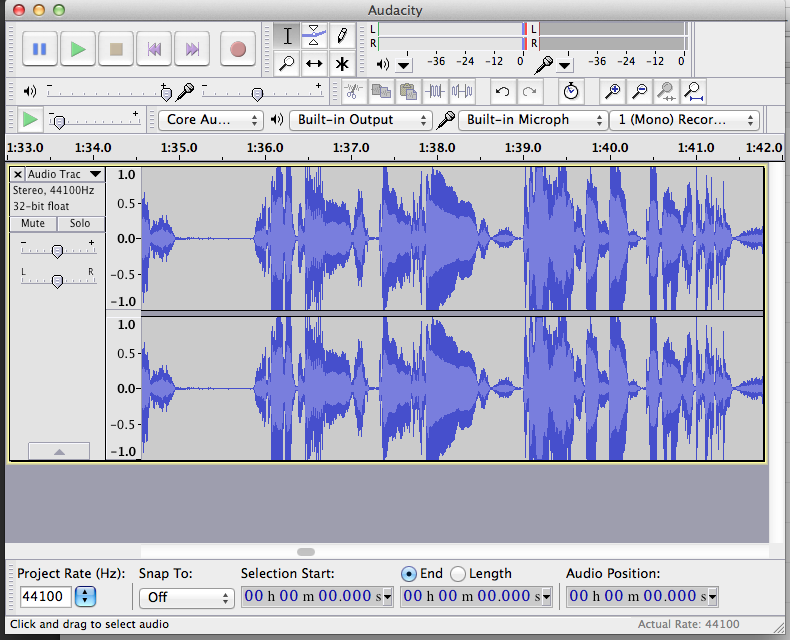 Audacity and Lame have allowed me to create my first podcast on Learning through Discovery in my personal and professional life.